Fourth Row Center: Film Writings by Jason Bailey: On DVD: "Bronson"
"My name's Charles Bronson," he tells us, "and all my life I wanted to be famous." And he was. He wasn't famous for starring in Death Wish or The Great Escape--no, this is the other Charles Bronson, the assumed name of Mickey Peterson, Britain's most notorious criminal. He first went to prison in 1974, at age 22, for robbing a post office; he's spent his entire life since behind bars (save for 69 days in 1988), most of it in solitary confinement, keeping himself occupied by taking hostages and beating up guards, as well as writing and painting. A renaissance man, if you will. 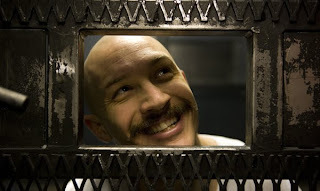 Bronson is Nicolas Winding Refn's loose biography of the famed thug, played by Tom Hardy in a riveting, finely-tuned performance. The screenplay (by Refn and Brock Norman Brock--Brock Brock?) has Bronson telling much of his own story, within the framework of an imagined one-man show in front of a well-dressed, appreciative audience. He recalls his youth, his initial forays into the world of crime, his escapades behind bars. His brief time on the outside--in which he tried to make a name as a bare-knuckle brawler, appropriating his pseudonym to sound tougher--is given screen time, but the film is primarily concerned with his bad behavior in the clink, and in the hole. Refn's stylish direction pulls us in, at least in the early sequences--it's all moody lighting and neon blasts and zippy camera work and brutal beatings wickedly underscored by ironic music cues. The energetic execution, supplemented by the darkest imaginable humor and blasted through a haze of thick Cockney accents, calls to mind those breakneck opening scenes of Trainspotting. The trouble is, it doesn't go anywhere from there. Refn basically spends the entire 92 minutes of the picture playing that same note, over and over and over again, without much in the way of variation or relief. The resulting experience is like having someone yell at you for an hour and a half. Look, I'm not automatically opposed to ugliness and bad behavior in cinema, and I certainly don't begrudge a film its anti-heroes, or demand anything as silly as "redemption" or "resolution." But a movie has to do something. Bronson doesn't. It's full of great, fist-pumping moments, but they don't add up to anything. Now, none of this is intended to take anything away from Hardy's performance, which has been widely celebrated, and justly so. He can turn from quiet intensity to spittle-flying rage on a dime, and his monologues hold us in thrall (as does the terrific scene where he acts out both halves of a conversation with a woman, one half of his bald head made up in drag). He cuts a terrifying figure, but his eyes are startlingly alive--particularly the repulsion and perhaps terror he has deep inside himself early in the stomach-churning "funny farm" sequence. It's a virtuoso piece of work, and the variations in his performance give the film its only true breaks in tempo. Bronson is a fine vehicle for a stellar performance, but as a narrative, it suffers from inertia; thing happen, yes, but all at the same pitch and pace. There's a monotony to it, a sense of a filmmaker grinding the gears when we want it to go, go, go. From what we see, it's clear that Refn has the gift of cinematic flash, and that Hardy is a compelling screen presence. But it's like a demo reel for the both of them. I'm looking forward to seeing what happens when they make a real movie. Bronson's got a dirty, gritty style that grabs us, and enough cheap thrills and punchy brutality to shake us. But at the end of the day, it's a bit of a one-trick pony. "Bronson" is now available on DVD and Blu-ray. For full A/V and bonus feature details, read this review at DVD Talk.